With the fuselage still firmly secured to the workbench, work has started on the setting out of the rudder assembly. As this will be a trike, some of the components shown in the drawing do not have to be fitted and are not included in the kit. The task of getting all the angles right is a little time consuming, especially crimping the ends. to form the traing edge. TIP: Don't drill the holes for the mounting bolts until the frame is constructed and temporarily held into position so the top of the rudder is in line with the top of the stabilizer and the correct distance away. Time to stretch the preformed rudder skin over the frame leaving plenty of material at the top and bottom. 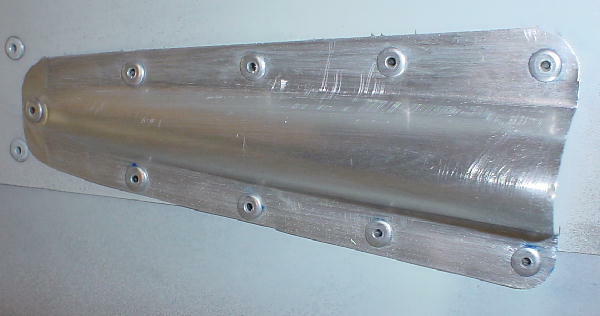 Start the rivet holes 50mm from the trailing edge, this way the metal will not dint or go out of shape. Trim the top edges after the rudder has been hung to make sure it lines up wuth the vertical stabilizer. 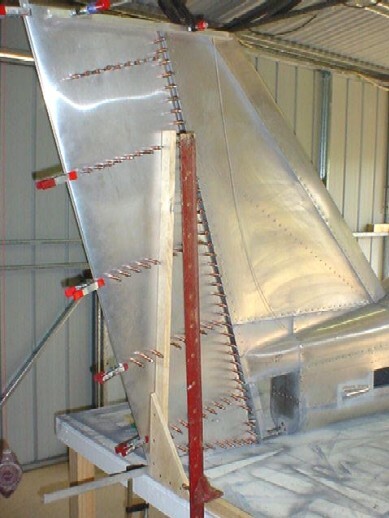 TIP: Before drilling holes in the skin, place the rudder frame inside the rudder skin and with blocks of wood up against the vertical stabilizer that is secured to the workbench, force the skin from the trailing with your hands so there is a tight fit and start from the centre of the trailing edge and work forward to keep the skin tight. 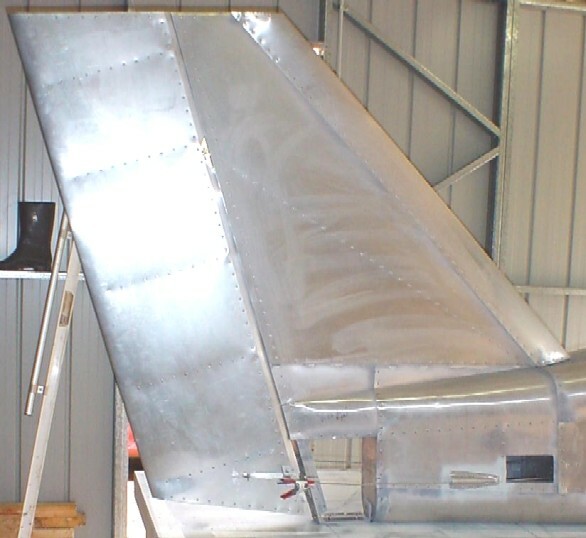 Following the advice from Sean when I visited the factory in May 2001, I constructed a rudder cable protector to aid the aerodynamics of the tail section and protect the cable as it exits the fuselage. TIP: Use a broom handle to form the shape of the skin and use the hand seamer to bend the flat edges to be riveted to the outer skin. 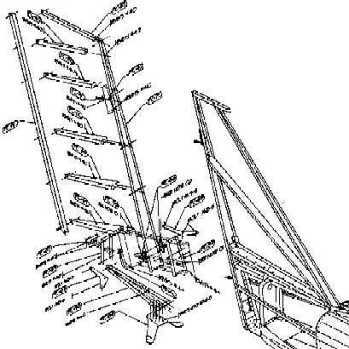 TIP: This image shows how the rudder can be kept vertical and prevent the frame from getting out of shape due to the rudder being wider at the bottom and getting narrower at the top. To make sure the rudder remains vertical above the centre line of the bench, clamp a square to the bench on one side of the rudder and a block of timber on the other side to keep the rudder in-line with the centre line, two lengths of angle on the top of the vertical stabilizer and the rudder, and a length of 1"x1"x1/8" angle along the trailing edge of the rudder. 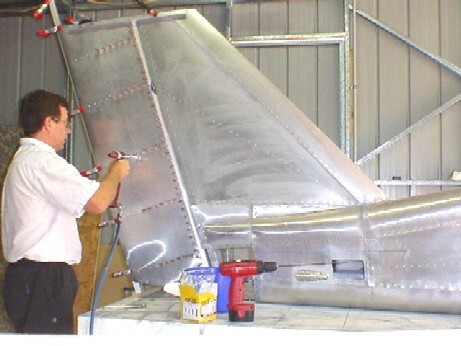 With the edges of the rudder firmly clamped to prevent warping, start the riveting from the trailing edge of the rudder toward the vertical stabaliser from the centre out, i.e toward the top and the bottom evenly. Alternate the riveting either side as this will also keep the rudder straight and true.